Bunions: Hallux Abducto Valgus is a deformity characterised by lateral deviation of the great toe, hence the most commonly used medical terms associated with a bunion anomaly are the terms ‘hallux valgus’ or ‘hallux abducto-valgus’ and ‘HAV’. The term hallux refers to the great toe or the ‘big toe’ and “valgus” refers to the abnormal angulation of the great toe which is commonly associated with bunion anomalies. This video shows the 3 stages of bunion deformity. The use of the terminology abductus and abducto identifies that the direction of the hallux is away from the mid line of the body and approaches the second toe. 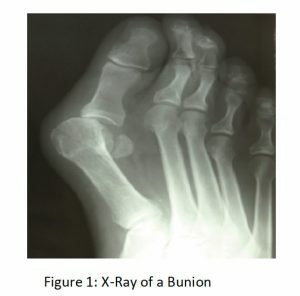 In the later stages of the bunion develop-mental progression the deformity can typically result in dislocation of the hallux from the metatarsal head1. Excessive pronation will cause forces to be applied to the forefoot, with increased load on the 1st metatarsal head in an adducted direction. This will allow rotation of the shaft and in turn the hallux (big toe) will compensate by abducting. A short 1st metatarsal or hyper mobile feet are considerably more susceptible, in this situation, the patient’s biomechanics is hereditary. As the 1st metatarsal adducts, rotates and drops to the ground to provide stability for the structure, a short 1st metatarsal shaft is a major contributing factor in the adduct-ing of the shaft to the midline of the body . When combined with pronation this caus-es the hallux to abduct, hence the term ‘Hallux Abducto Valgus’. (Lorimer et al, 1997; Selner et al, 1992; De Valentine, 1992). Similar foot mechanics issues appear to be the underlying causative factor being a shorter 5th metatarsal shaft which deviates or abducts away from the midline to gain ground control or stability , in turn the 5th digit adducts toward the midline of the body. Orthotic therapy at each stage can reduce the incident of the bunion progressing to the next stage. As the foot continues to pronate over several years the ground reaction forces en-courage the hallux into abduction and the extensor hallucis longus also becomes tight and pulls the hallux further across in a ‘bow’ like effect. 3. 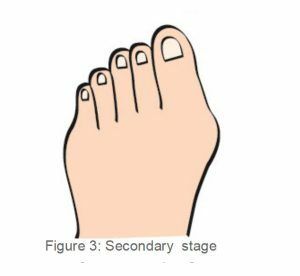 Tertiary Stage: If this situation is not controlled with orthotic therapy at the sec-ondary stage to prevent the condition from progressing further, the bunion will eventually move into the Tertiary Stage (or the 3rd stage– Fig 4). 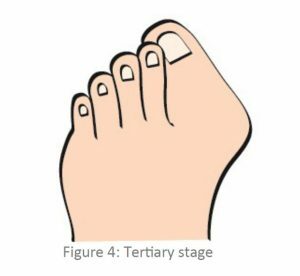 In the tertiary stage of Hallux Abducto Valgus an overlap-ping of the hallux occurs either above or below the 2nd digit. See fig 4 As this takes place the patient’s shoes become difficult to wear, and find it hard to find shoes to accommodate, as most shoes will aggravate the 1st MTPJ on the medial side (Thordarson, 2004). This stage is very difficult to treat, the patient may be in extreme pain and often find it hard to find footwear that can accommodate for the deviated hallux. Patients may need to consult an orthopedic surgeon to surgically correct the bunion deformity. Following surgery, the patient will need to have orthotic prescribed to treat the underlying biomechanical condition. Orthotics are essential to give the foot realignment and support, and prevent the reoccurrence of the Hallux Abducto Valgus (bunion). Prescribe an orthotic to realign and control the patient’s excessive pronation. Heat and mould the orthotic with the foot in the Neutral Calcaneal Stance Position (NCSP). Following heat moulding, monitor the patient, ensuring the orthotic is adequately controlling the excessive pronation – thus preventing further development of the bunion. When treating hallux abducto valgus with orthotic therapy, it is important to explain not only the causes of bunion development but also the 3 stages. By doing so the patient will understand why they need to wear orthotics and that by doing so they will prevent the bunion from progressing to the next stage. 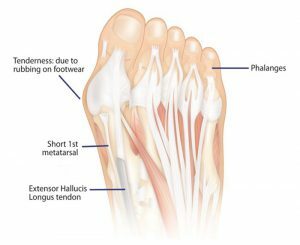 Treating Hallux Abducto Valgus with orthotic therapy will realign the foot, limit calcaneal eversion, thus controlling excessive pronation and taking pressure off the 1st MTPJ. However, monitor the bunion closely, if it worsens or continues to be painful, review the prescribed orthotic – make sure the orthotic is providing enough control, and check if the patient is continuing to excessively pronate through the orthotic. If the patient is continuing to excessively pronate it may be necessary to pre-scribe a firmer density orthotic such as the ICB Firm Green Orthotics, to ensure correction and control is being achieved. If the patient presents with a short 1st metatarsal shaft, the practitioner can create a Morton’s Extension on the orthotic. To do so place a Forefoot Orthotic Addition under the hallux (attach using double sided tape) – this treatment is only successful in the first stage. 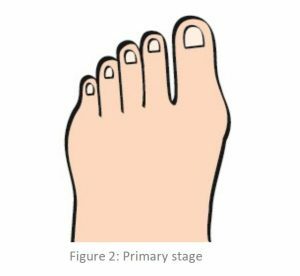 2.Bunions (Hallux Abducto Valgus)”. Footphysicians.com. 2009-12-18. Infor-mation Retrieved 2011-03-20- Tailor’s Bunion”.